Later today (at 6pm EDT New York time) Hall of Fire will be discussing the next chapter of The Hobbit as Thorin and Co. venture deep into the heart of The Lonely Mountain. Little they ate and little they spoke. They could not count the passing of time; and they scarcely dared to move, for the whisper of their voices echoed and rustled in the tunnel. It is hardly a pleasant thing to be trapped in a dragon’s back hallway, and Thorin and Company are soon compelled to find a way of escape, right through Smaug’s treasure chamber. Due to Bilbo’s quick action, the dwarves were saved from Smaug’s first onslaught, but what now is to become of them? Again it is Bilbo who takes the lead, offering to spy out the Dragon’s lair a third time. But Smaug is nowhere to be found. When the dragon’s away the dwarves will play, and there is much joy at the first sight of the tremendous hoard. Thorin rewards Bilbo with a dazzling mithril coat, and Bilbo himself finds a treasure worth all the rest combined, the great Arkenstone, Heart of the Mountain. Escape is finally made and comparative safety found, but larger questions loom. Will the Dwarves lust for wealth overcome their good sense? Even if they could get out the treasure, how would they get it home? Has Bilbo been seduced by the lust for riches? How will they survive the oncoming winter? Most of all, where, oh where, is that Dragon? 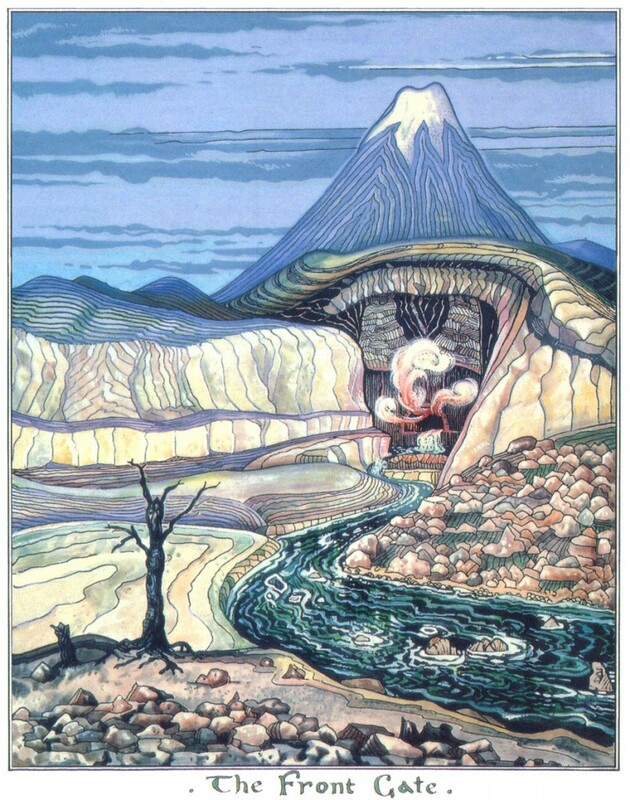 Join us in The Hall of Fire (in #thehalloffire live on our chat server irc.theonering.net) this Saturday at 6pm EDT as as we discuss The Hobbit: Chapter 13: Not At Home. The Front Gate by J.R.R. Tolkien. Our chats usually last about an hour, and are very newbie friendly. Simply drop in and join the conversation! However, our main room, #theonering.net is open 24 hours a day. We don’t always talk Tolkien there, but if you have a burning question, you’ll usually find one or two of “the regulars” up for a chat!